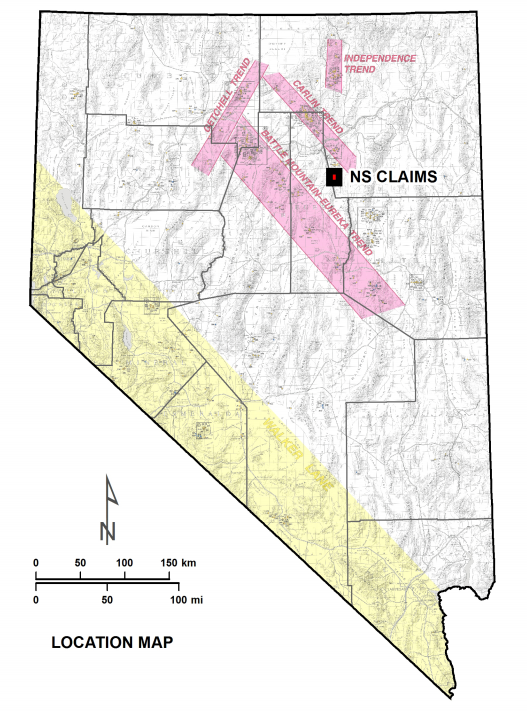 The NS Claims are located in the Pinon Range on the east margin of Pine Valley, 26 miles south of the town of Carlin. The property is located south of the developed extent of the famed Carlin Gold Belt. 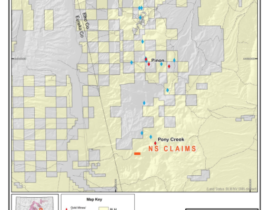 The Pony Creek Property is the nearest significant gold resource and is situated about two miles northeast of the NS claims. 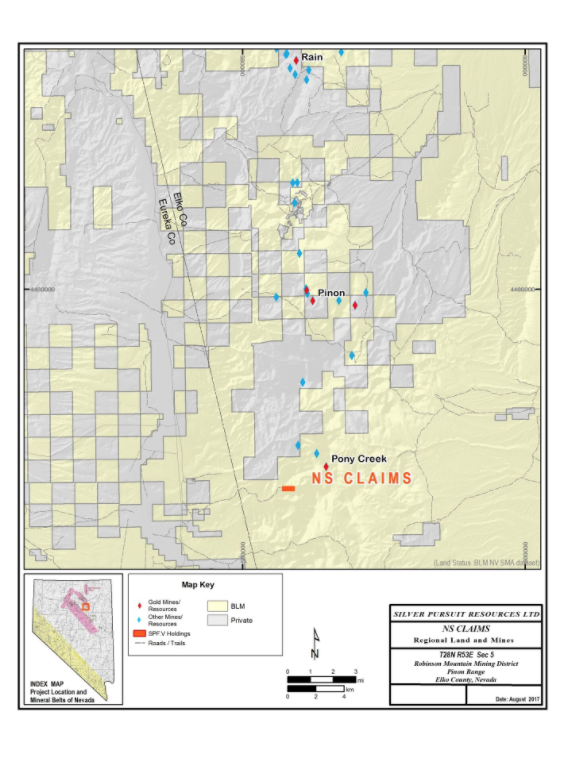 A 2011 update by Allied Nevada reports an inferred resource containing 1.426 million ounces of gold at Pony Creek. Four lode claims make up the current holdings at the prospect. Elevations range from 5900 to 7000 feet (1798-2134 m). 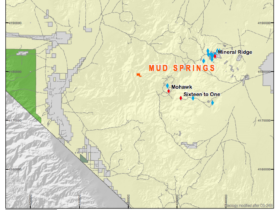 Precious metals hosted as bulk-mineable, stratiform sedimentary rock-hosted collapse breccia as at the Pinyon Project and intrusive-related gold mineralization like that recognized at the Pony Creek. The southern extent of the Carlin Trend that includes the Rain Deposit, the Bullion District, the Railroad District and Pony Creek. A 2004 “Evaluation of the Gold Resource on the Pony Creek Property” describes a resource of 1.1 million tons of 0.057 opt gold. 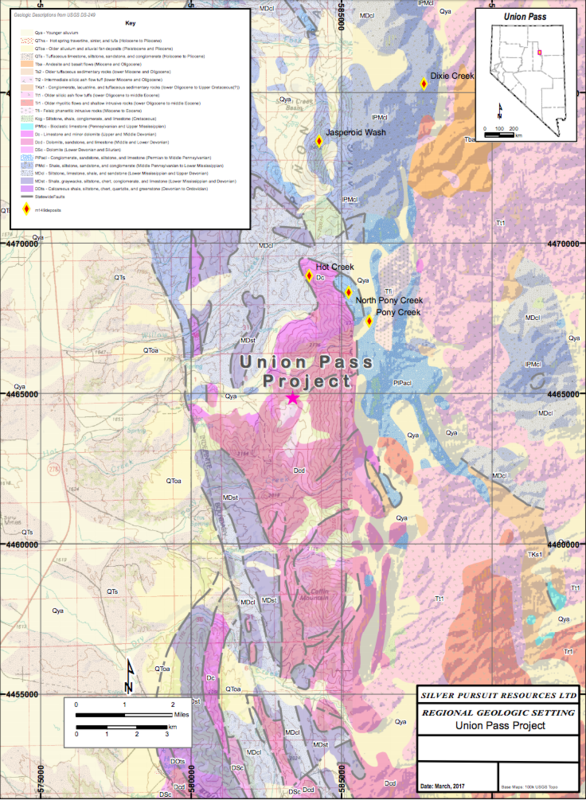 Allied Nevada’s Corporate Update (May, 2011) reports a much larger inferred resource containing 1.426 million ounces at Pony Creek. Eight miles north of the NS claims is the Railroad-Pinion Project controlled by Gold Standard Ventures. The southern portion of this advanced exploration project includes the Pinion deposit and Dark Star deposits. Pinion has an Indicated Mineral Resource of 31.61 million tonnes grading 0.62 grams per tonne (g/t) gold (Au), totaling 630,300 ounces of gold (announced March 15, 2016). 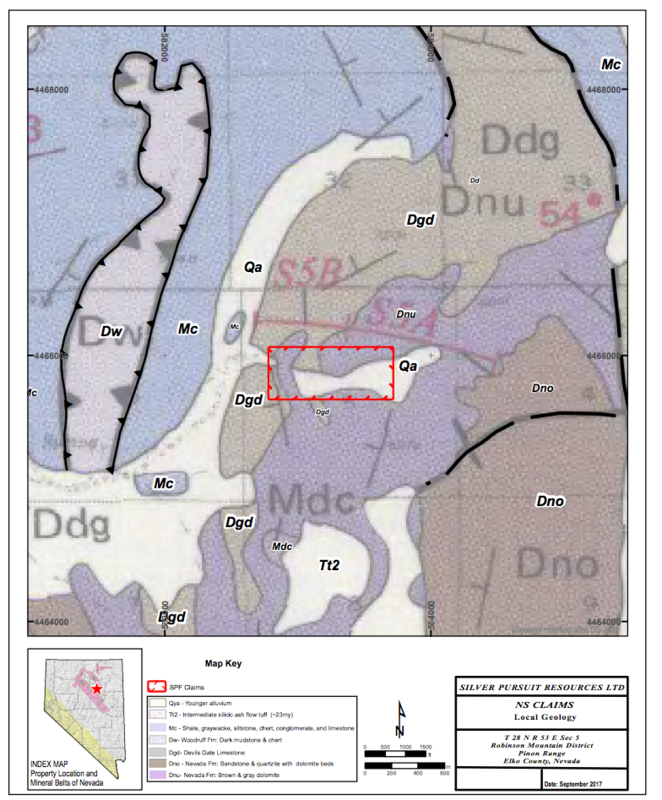 The Dark Star deposit, situated 2.5 km east of the Pinion deposit, has an Inferred Resource of 23.11 million tonnes grading 0.51 g/t Au, totaling 375,000 ounces of gold was announced March 3, 2015. 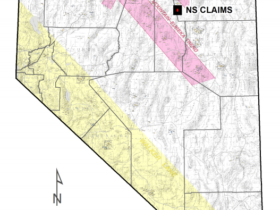 Several companies have worked in the vicinity of the NS claims including Westmont and Newmont. 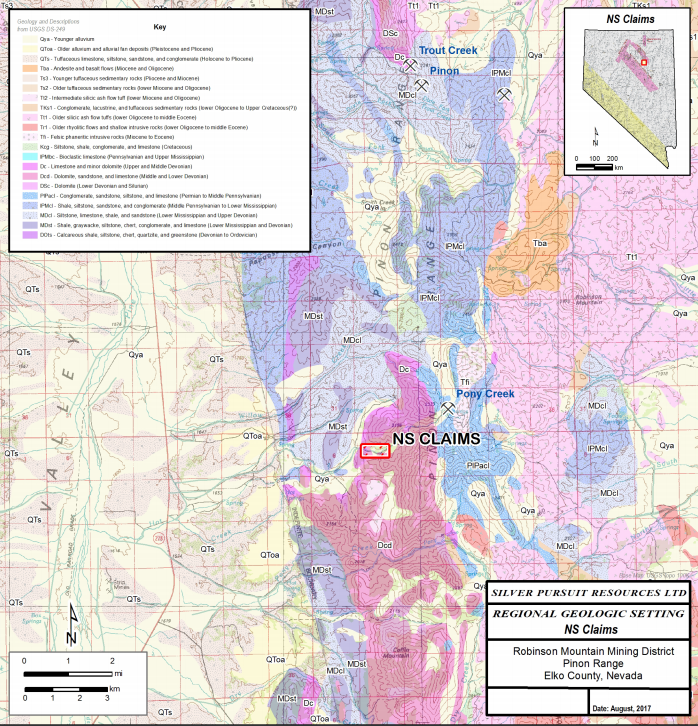 Large claimblocks have been held by Clover Nevada and Newmont since 1999 and 2004, respectively. To the south of the NS claims, an individual located the Scent claims, held since 2003. Recent staking activities have been carried out by Newmont and Tacoma. This recent activity surrounded the NS claims with staking to the east of the NS claims. The geology at the NS Claims consists of lower-plate, carbonate rocks that locally are capped by Tertiary ash-flow tuffs. The carbonates are Devonian-age and include the Devils Gate, Sevy, Simonson, and Nevada Formations. 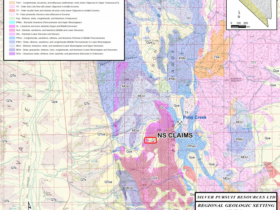 The NS claims cover a basin of east-westerly, trending alluvial cover along a strong ENE-trending structural lineament and may be the surface expression of a recessive-weathering, altered or broken zone in the rock units. 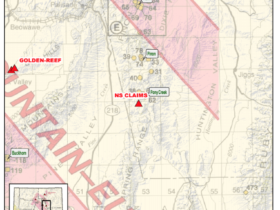 Regional mapping, by the USGS, suggests the claims are near the crest of a NW-trending antiformal structure. Such structural culminations are favorable targets for gold mineralization in the Carlin-trend as they may serve as hydrothermal conduits and may develop metal-bearing fluid traps. The potential for precious metals at the NS claims is not well-defined. 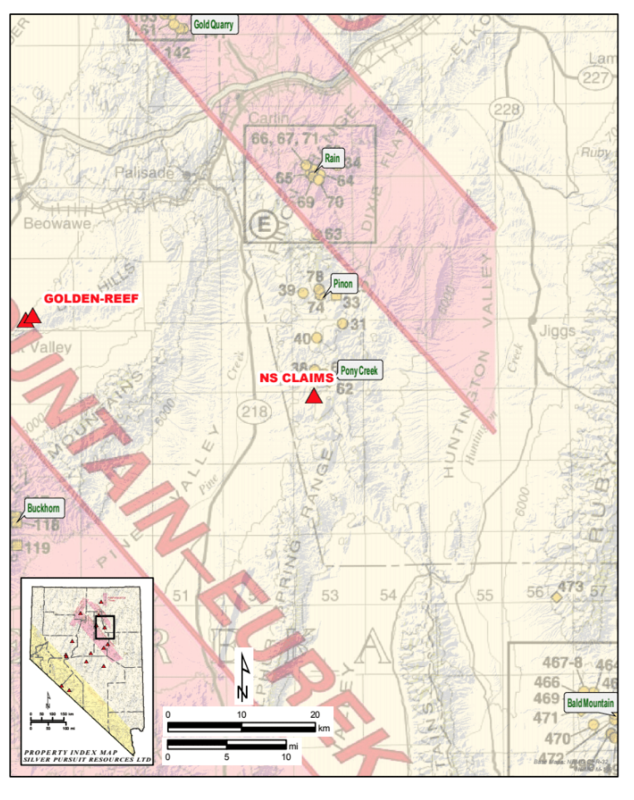 The location of the claims along the northwest-trending anticline, on the west flank of the Pinon Range and the close proximity to other known gold resources make the claims a favorable exploration area. Gold mineralization at Pony Creek occurs in the basal portion of an intrusive rhyolite and the underlying Paleozoic sediments. All significant gold mineralization discovered to date appears to be directly related to the rhyolite intrusive, occurring primarily along north and northeast trending structures in the felsite and in silicified and altered Mississippian-Permian clastic rocks immediately beneath and adjacent to the felsite (Russell, 2004). 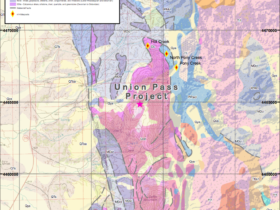 Mineralization at the Pinion project is described in the Technical Report (April 29, 2016) as being along a N60W to N70W trend with multi-lithic breccias. At Pinion gold occurs “mainly as finely disseminated gold in largely stratiform jasperoid (silicified) bodies that represent dissolution, collapse breccia developed along the contact between the Mississippian Tripon Pass Formation silty micrite and Devil’s Gate Formation calcarenite.” These rock units are thought to be present in the subsurface at the NS claims. 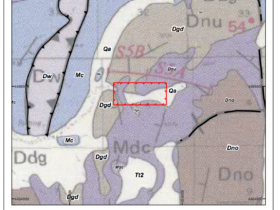 Geologic mapping is planned to determine if intrusive rocks and breccia float are present on the claims in float chips. Systematic sampling is to be carried out to establish the distribution of trace and precious metals at the project. Geophysical surveys may be conducted to gain understanding of the subsurface geology and determine favorable subsurface target zones to be drill-tested in the future.